This is a wonderful wireless keyboard with 2.4GHZ, plug and play! Bulit-in smart touch pad which can be used freely. Ultra mini design allowing you carry it around anywhere and anytime. Especially for travel and bussiness. 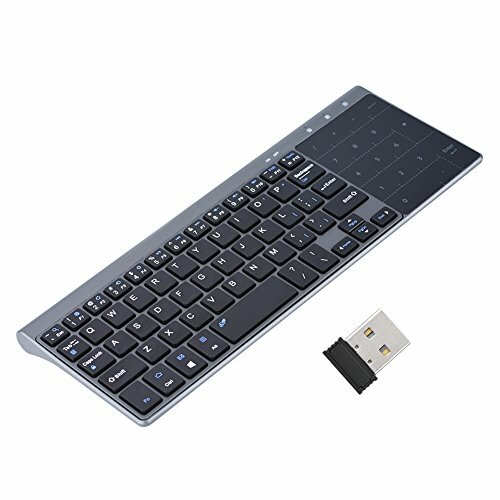 Reliable 2.4GHZ Wireless Connection--One plug and play USB receiver for keyboard without installing any additional software, ensures a strong and reliable connection. Mini and Portable Design--The keyboard is made of durable material, mini and compact design. Ensuring you carry it around anywhere. Super Smart Power Saving Design--Just need for two AAA batteries, and with energy saving sleep mode, you never worry about running out of power. Wide range of applications--Universal compatible with Android, for iOS, for windows system. Suitable for notebook, computer, TV box, and so on.